This entry was posted in electronic music and tagged electronics, granular synthesis, machines, music, orange, sound by roger. Bookmark the permalink. 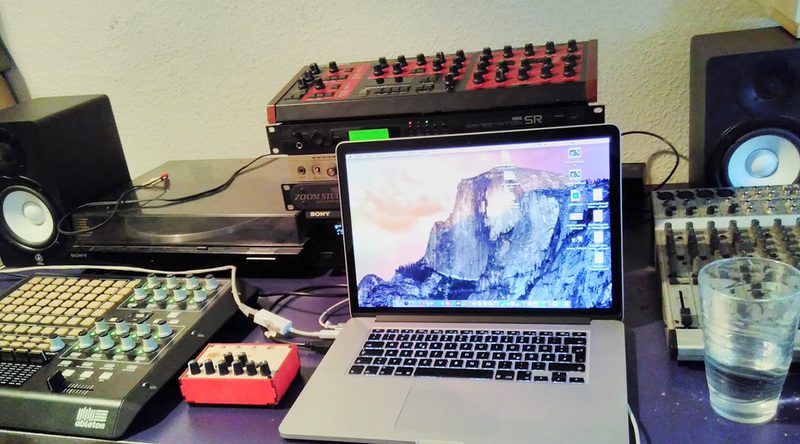 Your home studio setup looks great! I can rember some of those machines from former elekrodemestika jams in Bogota and Berlin. I am glad they have survived elektroschrott. Some of the machines I am currently using have also survived it, although with some consequences for the knobs and sliders. Dust and time can really affect electronics and analog knobs and buttons. The lumanoise sounds and looks fantastic. A very fun toy for performing and adding powerful gestures to any composition. I think this kind of compact devices are very curious and capable of producing surprising sounds. I have been playing with a tiny Gakken Sx-150 Mark II synthesizer. Perhaps will share a video about it in my next entry. Thanks for sharing the links to the software for music collaboration. I think we can defenitely experiment with that. I also started to use the hashtag #1000tracks #1000pistas in soundcloud for the tracks i have been recently uploaded. I think hashtags could help us to organize the metadata in a platform like soundcloud.